We are now accepting applications for the course preparing students to sit for the 2019 Spring SHRM Exam Window (exams administered May 1, 2019 – July 15, 2019). Our courses are 100% online and you can complete them at your own pace. National Paralegal College has partnered with SHRM to offer a SHRM exam preparation course that will enable you to establish yourself as a globally–recognized human resource expert by earning the new standard in HR certification: SHRM Certified Professional (SHRM-CP®) or SHRM Senior Certified Professional (SHRM-SCP®). These professional certifications can open doors for professional advancement, serve to harmonize standards with changing expectations and signal to employers your advanced professional development. This course combines expert instruction with the SHRM Learning System® for SHRM-CP/SHRM-SCP, so you will learn faster, retain more knowledge, and stay on track for success on the exam. Earning your SHRM-CP or SHRM-SCP credential makes you a recognized expert and leader in the HR field and a valuable asset to your organization – keeping you and your organization more competitive in today’s economy. This distinction sets you apart from your colleagues, highlighting your high level of knowledge and skills. The NPC SHRM course will prepare you for either the SHRM-CP exam or the SHRM-SCP exam. The SHRM-CP exam is for HR professionals who implement policies and strategies, serve as point of contact for staff and stakeholders, deliver HR services, and perform operational HR functions. 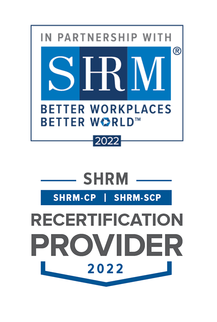 The SHRM-SCP exam is for HR professionals who develop strategies, lead the HR function, foster influence in the community, analyze performance metrics, and align HR strategies to organizational goals. The SCP exam is more challenging and requires more experience but leads to an even more impressive credential. While this course and exam are recommended in particular for students who have graduated from NPC with a Bachelor’s in Business Administration degree with a concentration in Human Resources Management, this course is open to all students and HR professionals, whether you have studied at NPC or not. The NPC SHRM Certified Professional course (HRM-401) is offered twice per year, beginning each September and April. All students who complete the practice tests and earn an 80% or better on the Post-Test will earn a SHRM Certificate of Achievement, regardless of how they ultimately perform on the SHRM-CP or SHRM-SCP exams. The cost of this course is $1,000, which includes access to the SHRM Learning System®, study materials, flash cards, and hundreds of practice questions (there may be an additional charge for shipping textbooks internationally). The SHRM-assessed fee for taking the examination is not included. NPC students and alumni are eligible for a 50% discount when they register for this course! * Less than a bachelor’s degree includes: working toward a bachelor's degree; associate's degree; some college; qualifying HR certificate program; high school or GED.